Have you ever tried to cook an omelet for more than two people? It can be tricky. Lots of egg whisking, lots of fillings, and lots of carefully monitoring skillets. I recently tried to cook omelets for about six people and when I was done, I realized that there must be a better way. So I came up with this fun Party Omelet! It has 12 eggs in it so it could feed about six people or you could slice the pieces thinner and serve it as almost an appetizer at a brunch or something. There are a few tricks to getting the omelet out of the pan in a clean way, but it’s still much easier than cooking a bunch of separate omelets! That, of course, allows you to drink more mimosas! This is my method for making omelets for a group of people. It’s about as easy as cooking twelve eggs at a time can get and you can fill it with anything! I go for ham and cheese, but it’s your world once you master the method! Preheat oven to 375 degrees F. Line the bottom of a baking sheet or jelly roll pan with parchment paper. Butter the sides of the pan or spray with nonstick spray. Whisk together eggs with milk and season with black pepper. Pour eggs into pan. 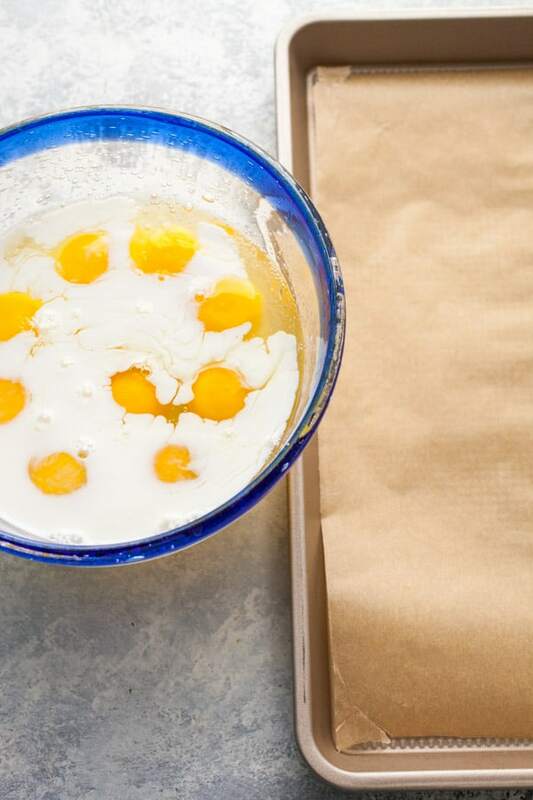 Bake eggs for 15 minutes until they are just set. 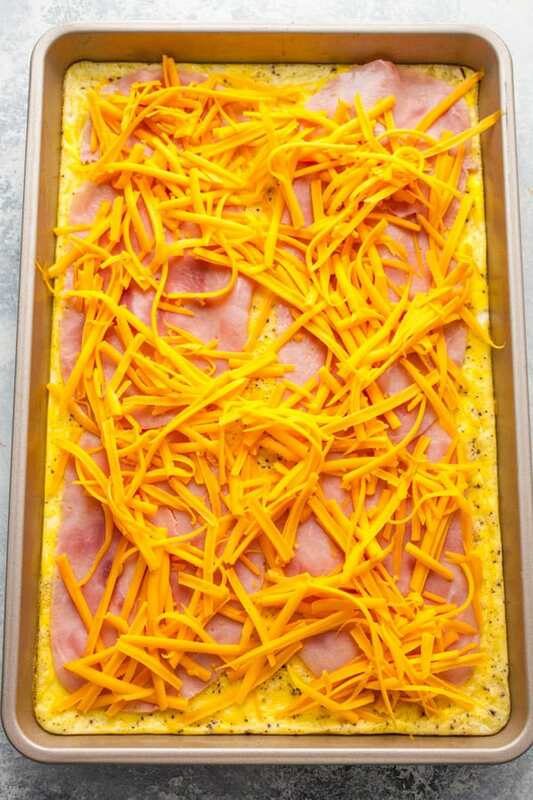 Add a layer of ham slices and grated cheese to the eggs. Don’t over-cheese them or you’ll have trouble rolling the eggs. Remove dish and carefully free the eggs from the pan by sliding a thin spatula or knife around the outer edges. Lift one long side of the pan out and carefully roll it up, peeling off the parchment paper as you go. 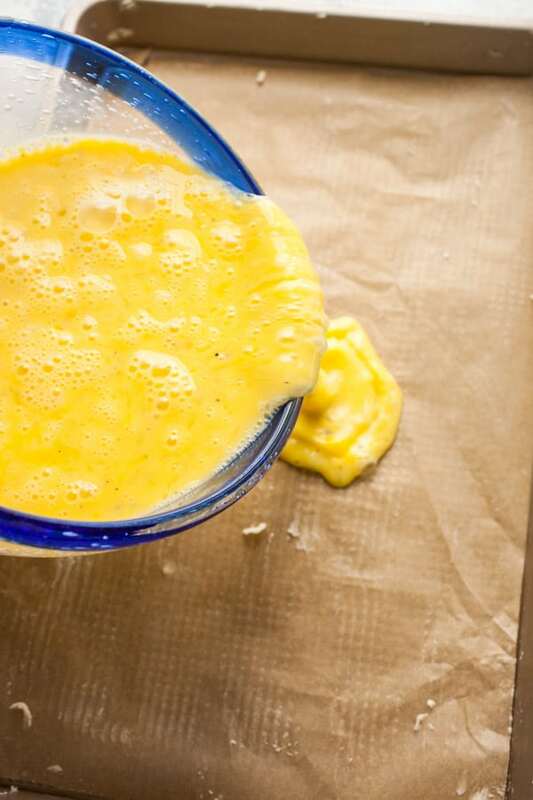 Transfer the rolled omelet to a clean plate and cut into six servings. Garnish with fresh parsley and salt and pepper. You’ll need a dozen eggs for this bad boy. Whisk them with some milk and a pinch of pepper. The most important part of this recipe is to line your pan with some parchment paper and take your time to get it as close to the edges of the pan as possible. This will make removal of eggs much easier! I also buttered the edges of my pan a bit, but I’m not sure that does much. Bake the eggs for 15 minutes at 375 degrees F. and they should be mostly set. If you are using a slightly larger pan (like a normal cookie sheet) you may only need 12 minutes in the oven. Now for the toppings! You could add anything that would be good in an omelet, but use restraint! Too many fillings and you’ll have trouble rolling this bad boy. 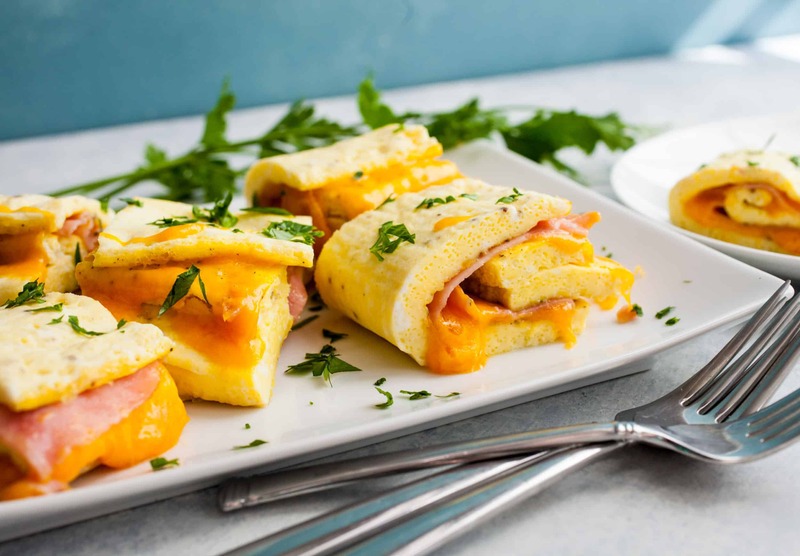 Bake the party omelet for another five minutes just to warm the fillings and melt the cheese. Now for the tricky part: removing the omelet! 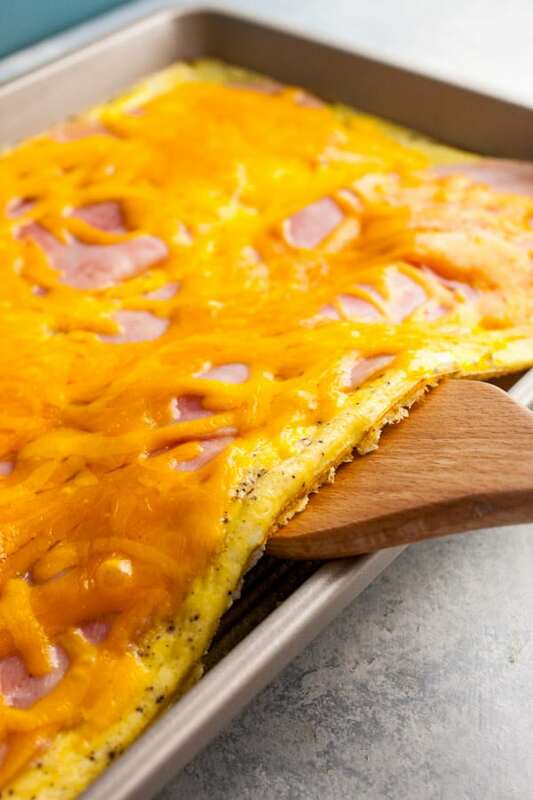 Use a thin spatula or knife to work around the edges, separating the omelet. 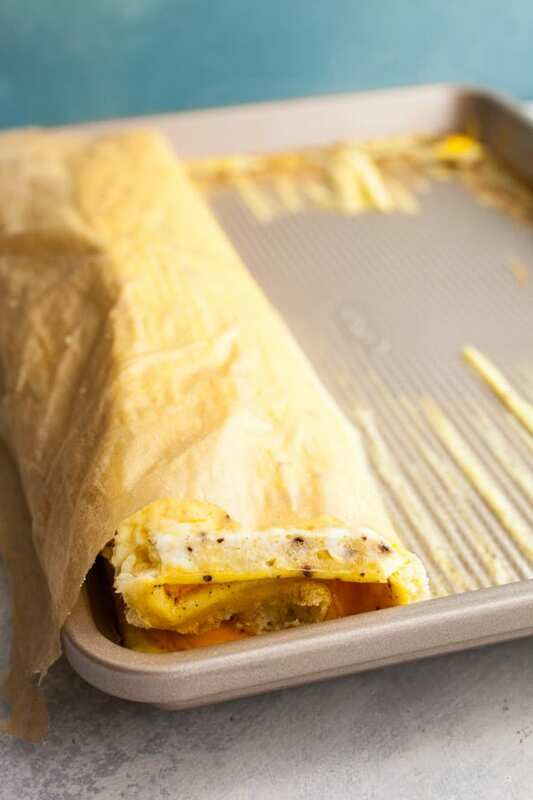 Then use the parchment paper to roll the omelet over on itself! 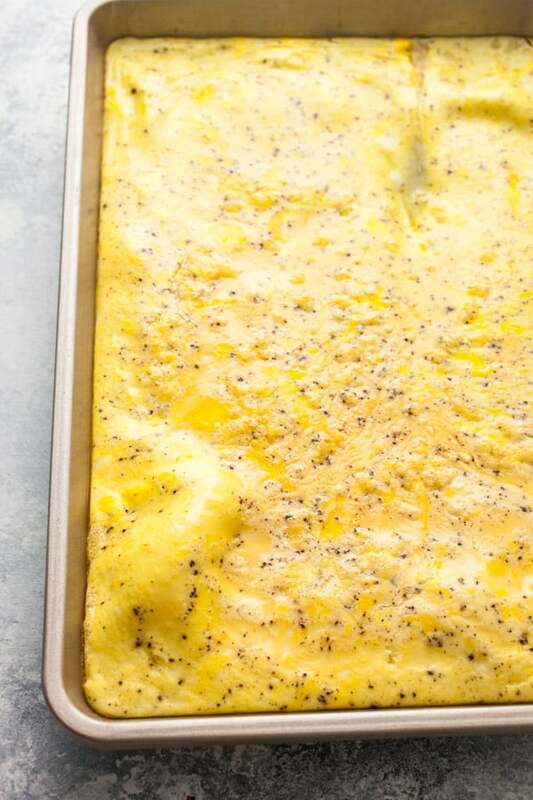 You can peel the parchment paper off as you roll, leaving you with a really clean omelet. Then just slice the large omelet into pieces and you’re ready to go! I like to garnish my party omelet with a little fresh parsley. I actually think you could make these, wrap them in plastic wrap, and freeze them for quick weekday omelets also if that’s your speed. 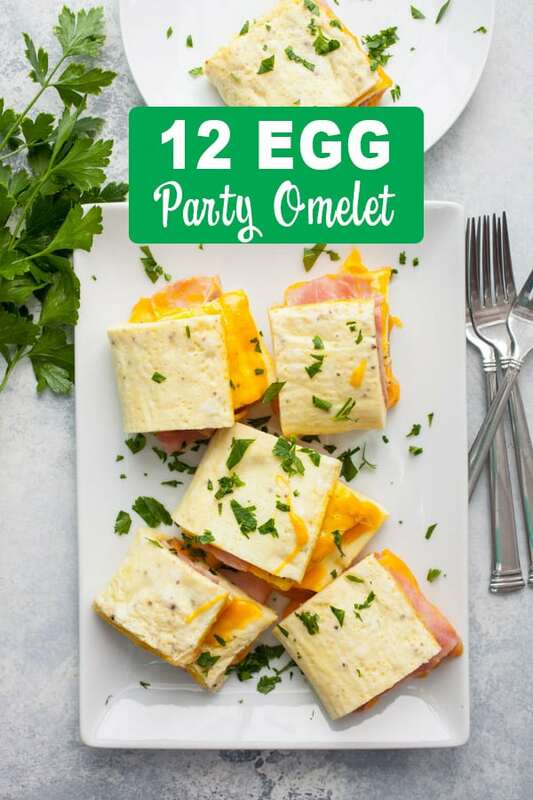 In other words, the party omelet could be for a party of one over many days! Have cooked omelets for 15 people! I just make 3 eggs/person mix that as standard with the ingredients everyone wants. then I do make them one by one but just have to add what single people want more! Yours is also a great way though. Oh boy! That sure is a bad boy! I once made with 6 eggs and my wife wished I hadn’t!. Oooh looks delish and much easier than cooking in a pan. I’ll have to give this one a go. Genius! Awesome way to feed a crowd! Now that’s a fluffy omelet.